Weather Resistant Heavy Duty Electromagnetic Gate Lock Kit can be used on pedestrian gates as a locking device. An electromagnetic lock (or commonly abbreviated as Mag Lock ) is comprised of two main parts: an armature plate made of metal and steel plate surrounded by a coil of wire which can be magnetized. When an electrical current passes though the coil, the steel plate becomes magnetized and strongly attracts the armature plate, creating a lock. 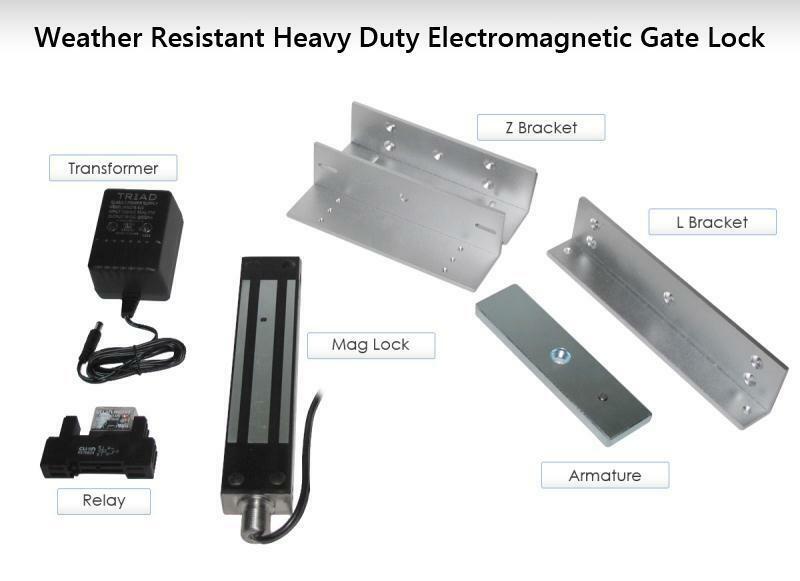 Weather Resistant Heavy Duty Electromagnetic Gate Lock Kit is designed for strength, durability, and security. It has a holding force of 1300 lbs, so it is unlikely that the lock will be forcibly compromised; the strength of the magnetic force is improved with a zinc finish. The Mag Lock kit includes a "z" bracket and "L" bracket for mounting. The mag lock has to be held off the face of the gate and overlap the second leaf or post. The "Z" and "L" bracket we provide in the kit allows for this mounting. The Mag Lock kit also includes a 12 or 24V relay and transformer. Gate openers are designed to put out a short pulse of electricity at the beginning of a cycle to trigger the release of a solenoid gate lock. However a magnetic gate lock is different; a magnetic gate lock needs power all the time and needs a break in the power when the gate opener begins its cycle. We achieve this by powering the magnetic lock off its own transformer and utilizing an external relay that uses the pulse from the gate opener to disrupt the transformer power going to the gate lock. We also customize instructions on how to wire this all properly with your gate opener. If you are purchasing the lock separate from a gate opener on the website be sure to let your sales rep know what gate opener you will be wiring this to.